Kurt Martin Fellert (1894 - ?) 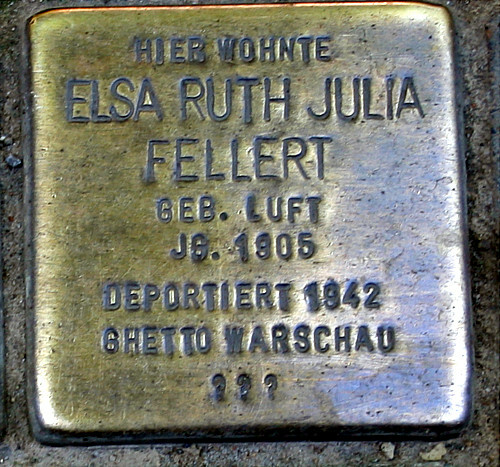 and Elsa Ruth Julie Fellert, née Luft (1905 - ?) lived together with their children Rita (1931 - ?) 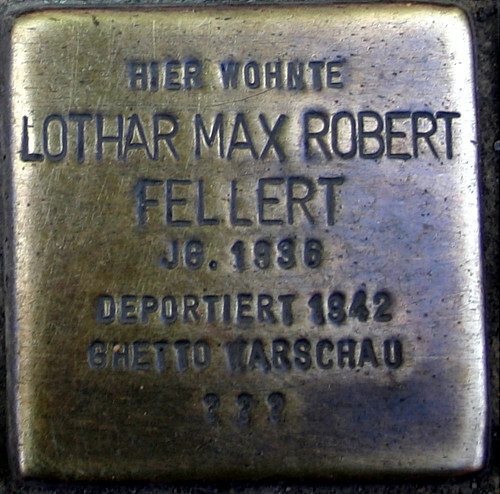 and Lothar (1936 - ?) at Richtstraße 49 in Frankfurt (Oder). 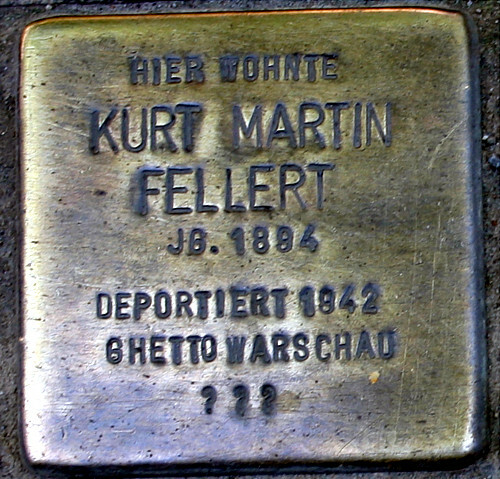 Kurt Martin Fellert ran a shop for textiles and workers' clothing. He was arrested after the pogrom night in November 1938 and kept for around a month in Sachsenhausen Concentration Camp. After his release he worked as a plumber for a weekly wage of 25 reichsmark and lived with his wife and son Lothar in a room at Rosenstraße 36. 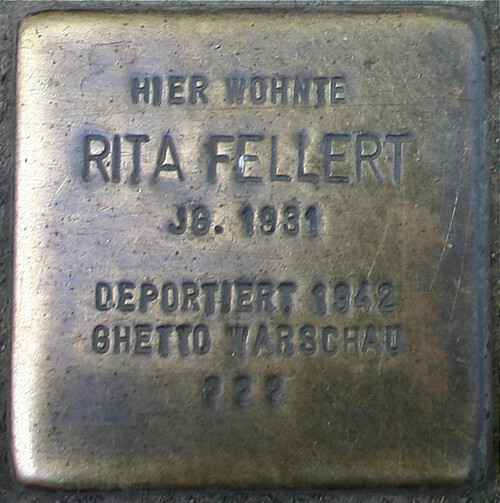 From January 1942, Rita was a pupil at the Baruch-Auerbachsen orphans' education institute in Berlin. Kurt, Elsa, Rita and Lothar were deported to the Warsaw Ghetto on 2 April 1942. Nothing is known about the further fate of the family. Sally Löschgold (1882 - ?) was married to Johanna Löschgold, née Zuckerberg (1880 - ?) from Weißenfels (Saale). They lived at Richtsraße 65 but later had to move to Rosenstraße 36 (the "Jews' House"). Sally Löschgold was a trader but had worked since 1936 as an office messenger at the Jewish Cultural Affairs Association of Frankfurt. In July 1940, Sally Löschgold asked the President of Finance for Brandenburg in Berlin - exchange control office - for "packing permission", in order to emigrate with his wife and children to Shanghai. However, Sally and Johanna Löschgold were deported to the Warsaw ghetto on 02.04.1942. Rosa Eisenhardt, née Feibusch (1873 - 1943) originally came from Neustadt bei Pinne and was married to Felix Eisenhardt (1869 - 1939). The latter was a voting member of the Jewish community and a businessman and proprietor of a leather shop at Richtstraße 50. Their daughter Martha (1896-1942) died with her husband Dr. Leopold Ehrlich (1882-1942) on 18.8.1942, after their deportation to Riga. Nothing is known about the further fate of Rosa Eisenhardt's granddaughter, Ursel-Helga Ehrlich. Rosa Eisenhardt later lived in a Berlin retirement home in Schönhauser Allee. On 13.07.1942 she was deported to Theresienstadt in the 20th transport of the aged. She died there on 09.05.1943.